Three editions and three RAAM qualified riders later, Globeracers’ Ultra BOB (short for Bangalore-Ooty-Bangalore) picked up speed with more riders learning about RAAM, getting the taste of endurance cycling via randonneuring events and, stepping it up with a target that would have eyes popping. Its no mean feat to even think of riding 610 Kms in 32 hours. One may even belch if told about the original 30 hour cut-off. When we learned of the terrible road conditions on the Guduluru Ghat, we extended the time limit by 2 hours for safety reasons. So, 610 Kms, 32 hours, a 1500 meter climb over 12Kms and just as much tough descent via Guduluru, and riding all the way back to Bangalore, with barely an hour or two of break to eat, stretch, do the deeds, and sleep! Fast forward so we can keep up with the riders. Rider Franz Hufnagl was the first to arrive at the start location, Bums on The Saddle, a cycle store in Jayanagar, Bangalore. By the time rest of the riders arrived, he and his crew had mixed all his drinks, lined up them in ice filled crates and ready to set up his bike one final time for the bike and vehicle inspection. Riders all received their bike and vehicle packages along with the rider numbers during briefing previous day, along with instructions on how to set up the bike and vehicle. Given some riders hire taxis for crew vehicles, inspection had to be delayed till just before the race. Despite documents providing clear instructions on the setup, none of the bikes nor vehicles passed inspection the first time around. In fact, it took us three rounds of each to get the inspection done, and call the job completed. A quick re-briefing of marshals, another round of safety instructions to the riders, and a late start at 10.27pm. All the crew vehicles lined up behind the riders, and the pilot vehicle led the riders the first 12kms till the turnoff to the Mysore highway. A lonely village road, 25 speed breakers in all, and innumerable dog chases after, the riders reached Mysore highway when the first crash took the most contended rider out of the race. Samim Rizvi, with his crew vehicle stuck behind all the riders on a narrow road, and even the most power lights not enough to light the dark roads, slipped and fell at the slippery turn on to the highway injuring his neck. This village road, despite speed breakers, is a fast section going out. We literally had to chase riders and caught up with them only just before the Mysore highway. All the riders and their crew cars were finally paired only once they were on the highway. At the first pit stop, about 75Kms on the route, we utilized 3G services and tracked riders using Solverminds’ Beacon tracking device that was tacked on to each rider’s bike. Tracking, monitoring and reporting made easy and manageable by this device that’s easy to use, charge and transport. With a little input, they will be developing devices that a runner can wear/carry as well, which will make tracking ultra runners easy on trails and unchartered routes. Those who understand crewing are still few in India and opportunities to learn from are also few. Most of the volunteers who signed up to crew and marshal in this race are cyclists and yet haven’t had the experience of crewing and/or marshaling. After a detailed orientation session before the race, crew and marshals were assigned to each rider. All the members got along and worked together and, by the end of the race, their experience and knowledge of crewing and ultra racing is multifold. A little after we left our first pit stop and headed towards Mysore, we received a call from Anil Kumar’s crew members that he wasn’t keeping well. We were told that they had already discussed his situation with Dr.Arvind Bhateja, the doctor on call for the entire duration of Ultra BOB. Doctor’s advice was followed and still, there was no improvement in his condition. Anil dropped out of the race at 80Kms. This is his second attempt to qualify. We passed all the remaining riders on the route, some on pitstops on the side of the road for feeding/resting/refreshing. At the scheduled time-station, 218km in to the race, we waited for the first of the riders to arrive. Around 5am, we received the first call that Samim Rizvi was dropping out of the race due to severe neck pain that developed after the fall 20kms in to the race. We made a note of it, and checked whether the call was made to the base station, manned by Navita Shyam. Navita Shyam is a Globeracer who contributes to the races time and again, and during Ultra BOB, she manned the base station phones for the entire 32 hour duration. 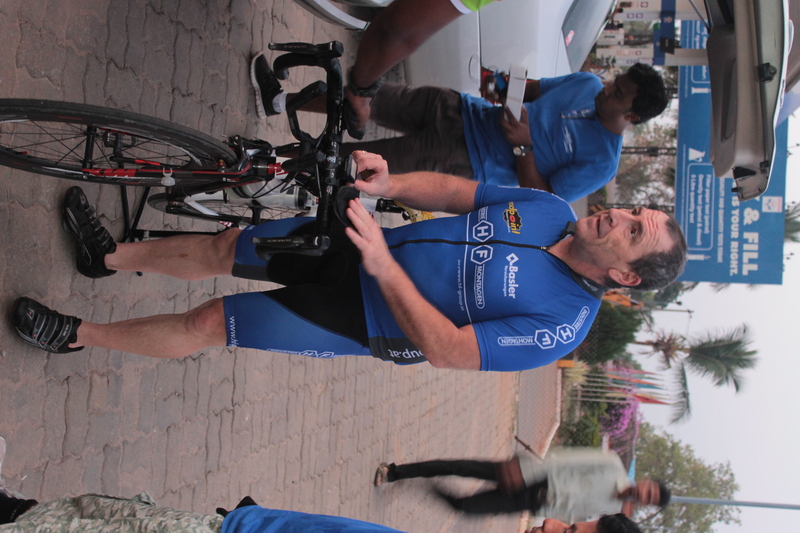 The first of the riders pulled in to Cafe Coffee Day, the first time station at about 5.50am. Santosh Mane, followed by Franz Hufnagl and VIshal K.
The toughest part of the race starts from here when riders enter Bandipur forest, on to Madhumalai (the Tamil Nadu portion of the forest), and start the climb up to Ooty via Kalhatty, a 12 Kms distance with a 1500 meter climb. 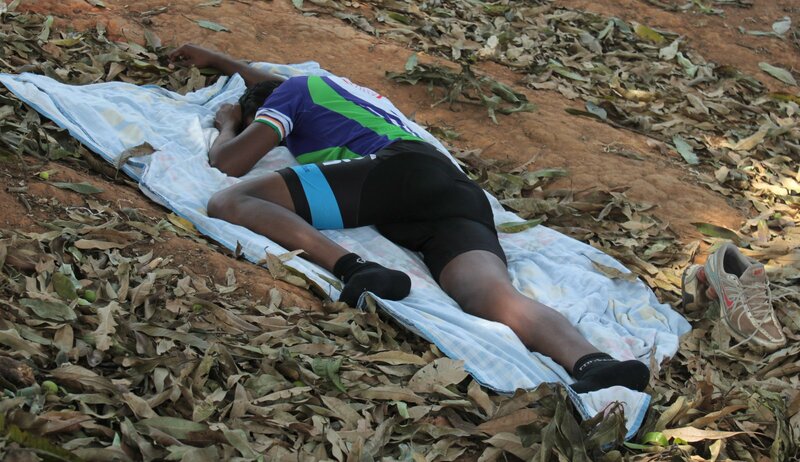 Every rider plans to rest, recover from the hard 218km night ride, before tackling the forest and the climb section of the route. It also helps that the early morning hours are cooler and making the best use of them works in favor of the rider. First to set off on the route was Franz Hufnagl followed by Santosh, and shortly thereafter, Vishal. Baskaran and Shreyas were yet to reach the first TS. If a rider chooses to use a mountain bike for the Kalhatty climb, from experience, we have seen that they manage to tackle the climb with comparative ease due its gear ratio combination. 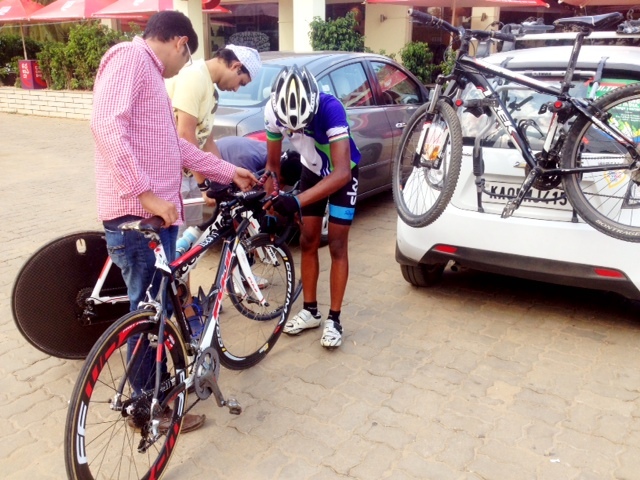 Samim having quit his race, loaned his additional cycles to Santosh, which already passed inspection. Santosh tacked on his bike numbers, and rode the mountain bike up Kalhatty after trying half the climb on his road bike. His feedback was that it was fairly easier on the mountain bike. We found Franz walking the steeper sections of the climb. As long as a rider has his cycle with him, they are allowed to run/walk/crawl with it or carry it! With a good ride plan, one can tackle elevations in these endurances with good result. Walking is a good way of retaining energy if one is trained to walk in place of riding up some climbs. 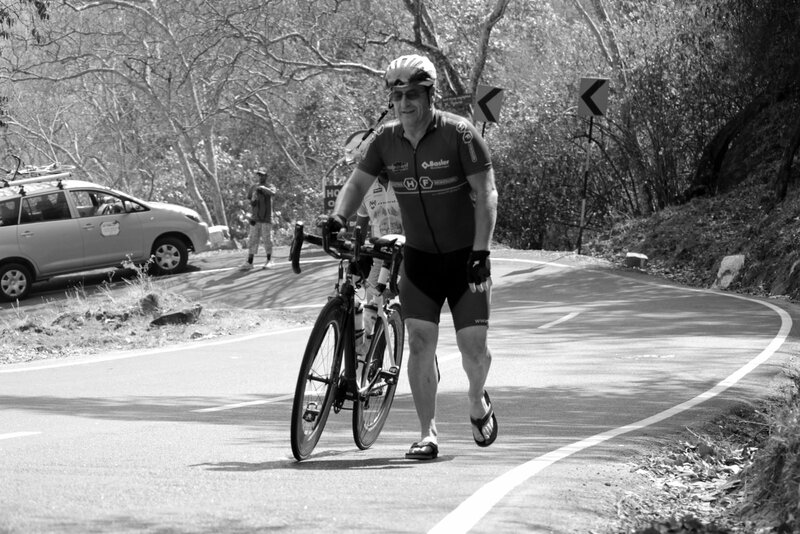 Even in RAAM, there is a climb called the walker, almost 4000kms in to the race where most cyclists are known to walk up the climb, which even Samim ended up walking during his 2011 RAAM participation. Using a different set of muscles, once trained, is a good strategy during ultra racing. Franz Hufnagl being helped by team during the Kalhatty climb. Picture courtesy Vijay Sai. Riders, one by one tackled Kalhatty, and three of them made it to the top within the time frame they set for themselves and also within the guideline time that was provided in the race docket. That meant these three riders had a good chance of finishing the race within the 32 hour limit that was set for the 610Kms RAAM qualifying category. Shortly thereafter, as we waited for other riders to make it up Kalhatty, we received a call that Baskaran abandoned his ride just before the Kalhatty climb, suffering from high fever and nausea. 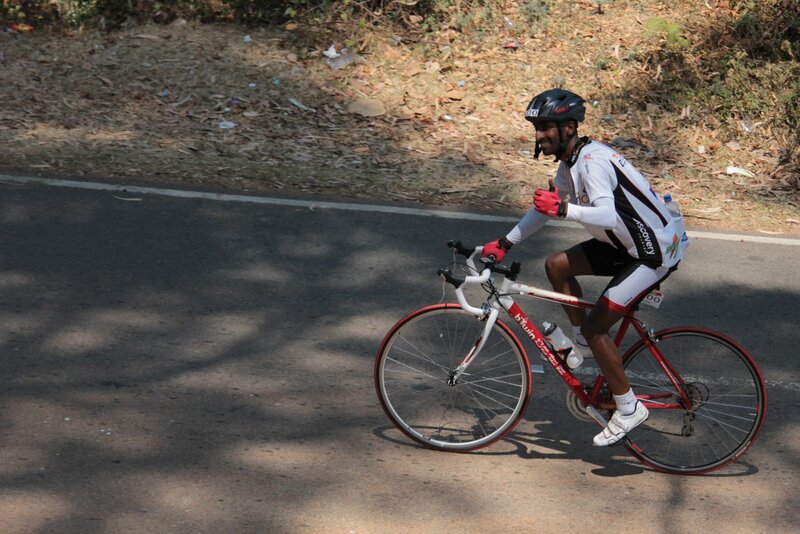 Baskaran had recently participated in a tough 1000km brevet, completing it in 69 hours. Factors influencing his abandonment of this race could be the fast pace of the race, and possible lack of full recovery from the brevet. We wish him well. He is a strong rider with a marshal arts background. It was now starting to get monumentally tedious for the riders as the Guduluru Ghat section is 30Kms descent that is made up of some steep inclines and very bad roads. All of the riders who made it up Kalhatty in time, which is the second TS, chose not to break the rhythm but continue on to Guduluru and then plan for the next big section of the race, the ride back to Bangalore! 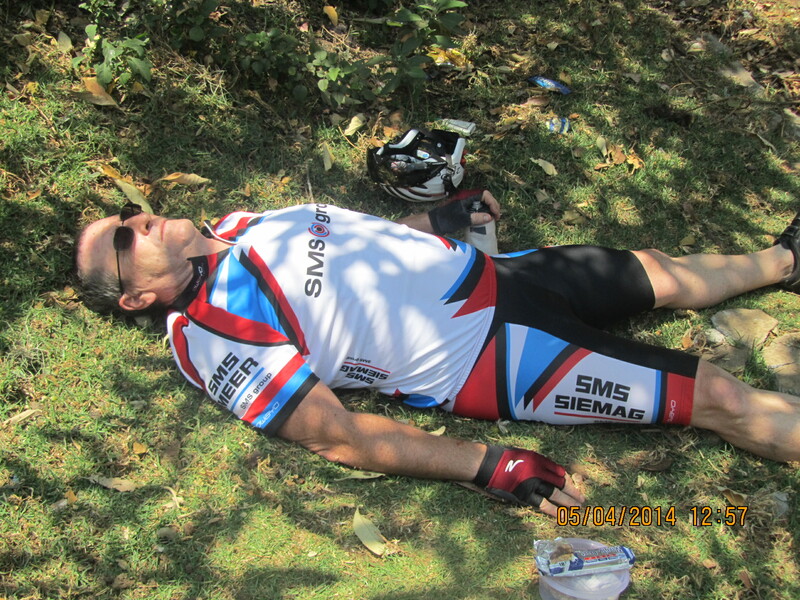 Franz Hufganl gives his body respite under a tree in Guduluru before he sets off to Bangalore. Image courtesy Vijay Sai. From here on, it simply is mind over matter. Having tackled the toughest section of the route, it now comes down to fighting sleep, getting over some steady climbs on the way back to Bangalore and keeping up with the clock, ensuring speed doesn’t drop below manageable levels. As we left the forest section behind us and reached TS3, we kept a tab on Shreyas Gowda’s progress via the Beacon tracking system and were a little worried that he had been on the Kalhatty Ghat section for much longer than rest of the riders. His idling time was getting longer and longer after climbing a few switchbacks at a time. We called and were told by his marshal, Nelson, that he has been stopping quite often and finding it difficult to deal with heat and exhaustion. We continued to monitor his beacon and were worried that it would go offline soon if we didn’t exchange his unit, which was scheduled to be done at Kalhatty top. Once at TS3, we kept a close watch on his beacon, and kept the line open with his marshal. 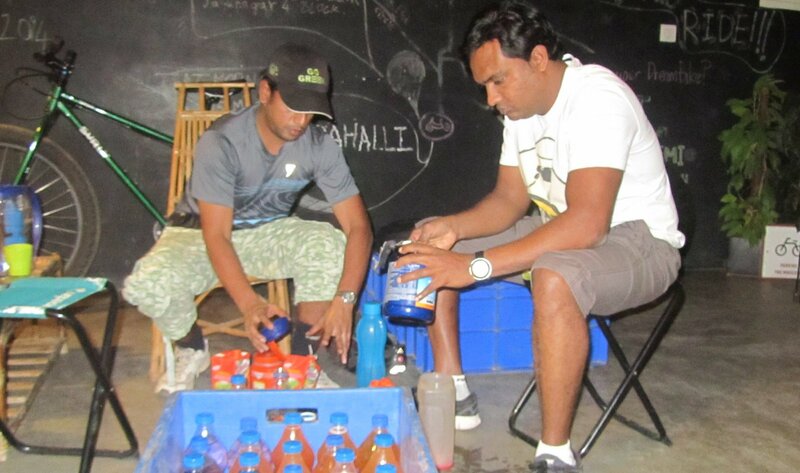 At about 5.50pm, we received a call from Nelson, Shreyas’ marshal that he chose to abandon the race. He would not make it through the forest section before dark, on the way back to Bangalore. He said he would be back another time to finish what he started! Good call to complete the Kalahatty climb before he quit for it will allow him to measure his readiness, fitness and ability while making his next race plan.. We wish him the very best and safe, fast rides. Having a fellow cyclist on the crew, especially one who is as experienced as the rider is, or has crewed before, makes a world of difference in these races. Santosh Mane showed exemplary focus and determination to win this race, and was ably assisted by his crew and professional racing teammate, Shivaraj Malligewad and marshaled by another fellow cyclist, Avinash, who leads Bangalore Cycling Group members on many rides. This was a dream team from the beginning though they came together only the day before the race. Feedback from all the riders and crewmembers is unanimous that marshals though very helpful and friendly on the ride were strict when it came to enforcing rules, penalties and maintaining decorum. Globeracers Ultra BOB had a great set of volunteers, both on crew teams and marshals. Volunteers who came along to document the race showed patiences and interest providing some great photographs of the riders and the event. April 5, 2014, 9pm: Another rider goes off the route. With clock ticking, and riders now exhausted, we kept a close watch on the tracking system via the Beacon systems’ coordinator who traveled with us and the on-ground monitors in Chennai. Now with 3 riders on the route, Santosh Mane, followed by Vishal K and Franz Hufnagl, we geared up for another long night. Shortly thereafter, we received a call from Khuram Pasha, Franz Hufnagl’s marshal that he chose to quit due to cramps brought on by severe dehydration. He was finding it difficult to apply brakes or change gears. Another learning for the rider and the crew! No ignoring water breaks, which we were told was what happened during the Kalhatty climb. Tough luck, for he only had another 160Kms left after riding through the toughest section of the race. After a request from his crew for help with transporting his cycles back to Bangalore on our car rack, we went back to meet up with Franz’ team, packed his cycles on our car, and set off to meet the remaining riders, now down to two. We realized it was going to be a fine battle between Santosh Mane and Vishal K for the top slot. Both seemed to be in good spirits and fairly energized by the knowledge that they were on the last leg of the race, and that only two of them remained on the route. Once we arrived at Bums on The Saddle, Jayanagar store, the finishing line of the race, we received news from the beacon monitory team that Santosh was just 40kms away, and Vishal fell behind considerably. Our base station time marshal, Navita, informed us that she received call from Khuram, Franz’s marshal, that he had quit at 9.45pm. Throughout the previous night, and that day, she had worked exemplarily and with focus, a great outdoors and sports person that she is. Navita Shyam, on one of her many mountain climbs. 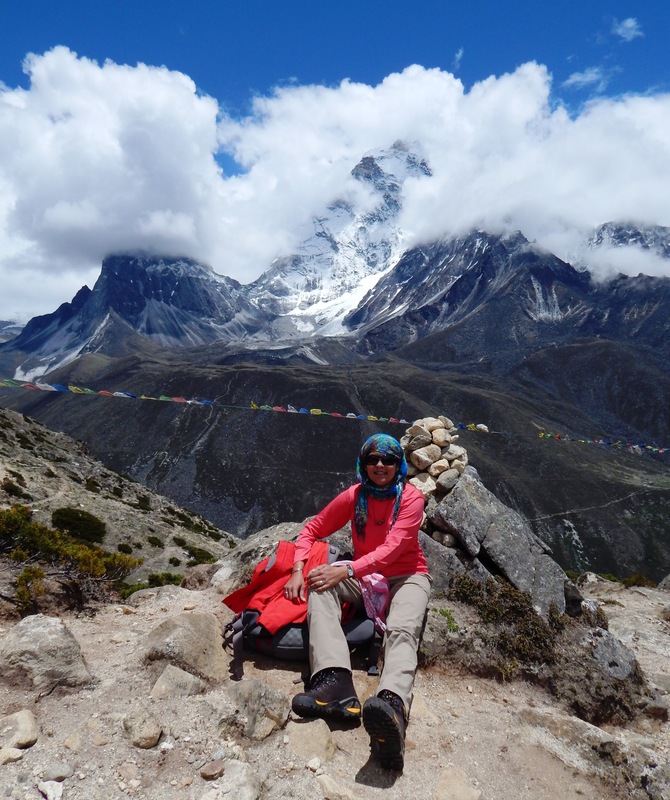 She is a trained mountain climber and guide, with an accomplished career in rock climbing and passion for cycling. By midnight, as the day changed, Santosh Mane was just under 40Kms to the finish line, and Vishal K was another 90Kms behind him, and taking longer and longer breaks to fight off sleep and reenergize. The group of volunteers, and a few who gathered to cheer the finishers waited at Bums of the Saddle store, which was left open for this purpose, in the middle of the night, manned by Karan Bhuta. It is great to have a finishing line venue where riders can relax and refresh post the ride, and have those volunteering, rest after days on the road! As Santosh neared the last 10 kms of the race, his crew, including his taxi driver egged him on and cheered him through the now empty roads at 1.50am. 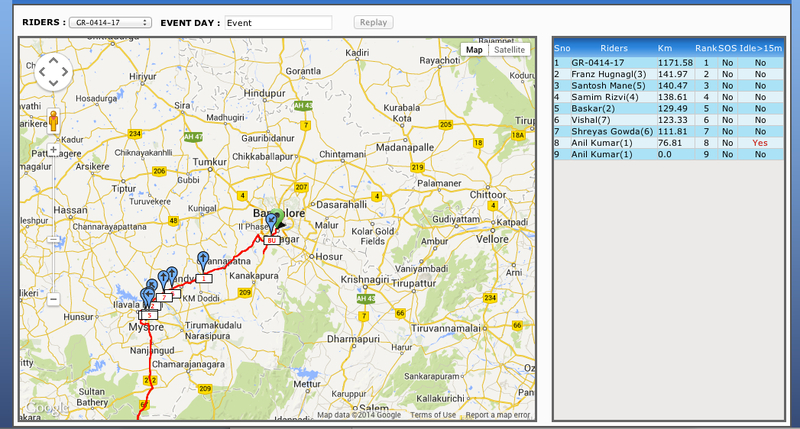 From his recollection and our monitoring, he approximately rode the last 7kms in 11 minutes, timetrial style! If someone can find that kind of energy after a 603km ride, we have got to appreciate the spirit and grit of the rider! Way to go Santosh Mane, and for becoming the youngest rider to be RAAM qualified, at 21 years of age. He took 28 hours, 02 minutes to win the race. This was going to go down to the wire for Vishal K, as he approached Bangalore, and with a little bit of confusion on the turn off from Mysore road, he was anxious and rushing through the last 40kms to get to the finish line! Having registered just before the race, his preparation for the route was from recollection of having been on it earlier. Not realizing that he still had another 33 Kms once he reached Kanakapura junction. He finally broke his cool and fought with his crew members that they were guiding him in the wrong direction, until he was shown the map, the route directions and goaded to ride and not lose another minute! Never set off for a race without reading the maps and mentally riding the route every section of it! It really helps at times such as these when your body starts giving up on you and confidence in your crew starts waning. Vishal K arrived at BOTS with 28 minutes to spare on the clock and became second person that night to qualify for RAAM with 31 hours 32 minutes for the 610Kms. End of Globeracers’ Ultra BOB 4th edition. Next on is the Twin City Express, August 2014 – details coming soon. A lot of credit goes to a few folks who, in the background, enabled smooth functioning of the race, and provided support to riders and the crew. We had a great team of volunteers, co-conspirators and just fun folks, pitching in wherever needed, and cheering us when things got tough! Khuram unconditionally supported the race, having been involved in BBCh races, leading them from the front. His knowledge and experience proved invaluable to the organizing team. He then doubled up as a marshal for one of the riders on the race day. His patience and perseverance strengthened the morale of the core team when needed. Thank you, Khuram. Look forward to working with you on many more races. To be mentioned in the credits is Rehan of International Ice Plant. They delivered ice in bulk to the start location at 9pm, way past their closing time so that riders had ice that wasn’t already melting, to store their drinks and food. We struck out with many other ice plants around the city, and when we mentioned the requirement to Rehan, he was willing to provide us ice, door deliver, with ice boxes, just in time for the race. If you ever need their services, you will find them via Just Dial or look up International Ice Plant, Bangalore. All the volunteers from Go Green cycling, Bangalore Cycling Group and Light Trails made the race a community affair, and a pleasure for the riders to be supported by a cheerful crowd and the race, a success. Many thanks to Vijay Sai, Avinash, Trilok, Ajay, Amruth, Nelson, Gilbert, Vijay Kumar, Karan Bhuta, Naveen John, Sidharth, Rohan Kini, Asif Attar, Shivraj, Kamal, Rajesh, and all the crew members who accompanied riders. Thanks to Bums on the Saddle team for allowing us use of their premises, Jayanagar and Infantry road stores, for the race start/finish and briefing/post race get-together. Three cheers to the finishers and all participants, their crew, marshals, vendors and support members. Thank you Dr.Arvind Bhateja for your valuable support and medical advice to the riders throughout the race, which enabled them to either continue with administered care or call it day. Thank you Navita Shyam for your crucial base station time marshaling and support, which enable riders and their crew to have an anchor and a human voice they could reach for reporting and clarification, when no other numbers could be reached. Thank you Fred Boethling and Rick Boethling for your tremendous work in organizing RAAM that continues to inspire and motivate riders around the world, and for giving us your approval to hold qualifying races in India, while ensuring their sanctity and integrity.